Building your own greenhouse is a fun project that can be tailored to meet your budget and gardening needs. The pole barn style is an easy one to work with. This is a guide about building a pole barn greenhouse. 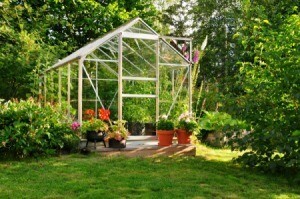 I am planning on building a greenhouse this spring/summer. In my mind's eye, I am seeing it built like a small pole barn or lean too, with galvanized barn panels on the bottom 35 inches, and the clear plastic panels from that point on up, with a ceder trim covering the point where those 2 materials come together. The roof will also be the clear rippled panels. I have not found a door yet that I like (thinking a screen door with glass panels that can be removed) and I will be putting a couple of vents in it as well. I am planning on it being around 10 x 16 or possible 12 x 16 or 18. I have not seen quite what I want on pinterest so was wondering if any of you have made one? If so, can you post some photos? Also looking for photos of your inside shelving. A good part of my lumber for the framing (and possible shelving) will be recycle lumber (thanks to a tornado I have an ample surplus of that). Not sure if I want it on a concrete slab, or patio pavers or river rock. Anyone want to share their experiences on a greenhouse with me? My son built me a greenhouse years ago and it sounds similar to what you are thinking about although I believe you are still in the "planning" stage as to just what you are wanting to build. That is good as once built it is difficult to make major changes. I do not know what kind of weather you have but be sure the roof and walls will withstand whatever happens each year. We used mobile home slabs for support/foundation and covered the ground with newspaper and then mulch and it has lasted for several years. We do replenish mulch occasionally but mostly we just scatter borax around to keep any unwanted critters out. We have a closable vent at each end and 2 fans for circulation as well as electricity for lights for growing purposes as well as for warmth if needed in the winter. A door at each end helps with circulation when needed. We have work tables along the walls with shelves above the work area and anywhere else we can place them. Shelves can be made of wood but drainage is usually necessary. Sorry - no photos right now.